Develop athletic strength, increase your flexibility, and melt away that unwanted fat with this results-guaranteed workout program! 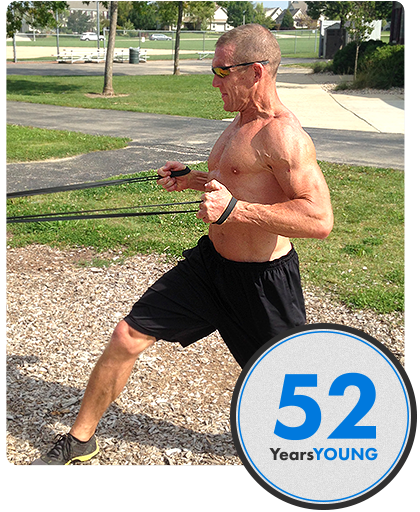 Over 20 years ago, I began my journey to create Resistance Band Training Systems. It all started when my body was breaking down from training too heavily with weights, and injury after injury kept me from training how I thought was the right way. I was your typical “hit the gym and lift heavy weights” kinda guy—you know, the wannabe bodybuilder and athlete. But the fact is I was slow, inflexible, and prone to injuries. 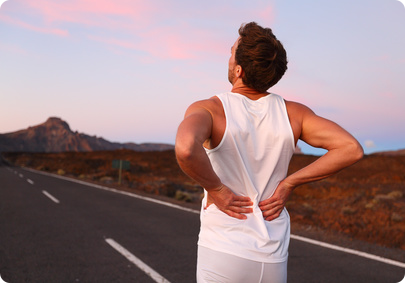 In fact, I vividly remember waking up each morning with new aches and pains from the previous day’s workout. It used to take me 10-15 minutes each morning to get warmed up for my day—and I’m not talking about for a workout! Sure, my body had an athletic look, but I didn’t move like an athlete or feel like one. That all became crystal clear the day I tried to sprint and the workout ended abruptly with intense back pain. All the aches, pains, and stiffness were on top of life starting to get incredibly busy—I had a full-time job as a physical therapist, a new growing family, and all the other responsibilities that came with being an adult. All this meant something had to change. And NOT WORKING OUT wasn’t an option. I needed something that not only provided me variety in my workouts and allowed me to work out intensely but also allowed me to train at home, at the office, or on the road. That was in 1996, and it led me to start experimenting with resistance bands. I had always used bands with my rehab patients but never considered it as a possible workout solution. Well, at that time I was only familiar the traditional tube bands or rehab theraband that you see in most stores and in most gyms. Unfortunately, that was not going to work for a 32-year-old guy who still wanted to train hard and athletically. Not only did they break easily, but I wasn’t able to create enough resistance to challenge my body. Plus, something didn’t feel right: I wasn’t able to move the way I felt like I should. So I began my long search that resulted in what you know today as the Quantum Band™, a 41-inch looped band made of 100% latex (no fillers) and designed to last years (even under the most intense training). In fact, my Quantum Bands are the most widely used resistance bands by top fitness professionals across the world, including many professional sports teams. 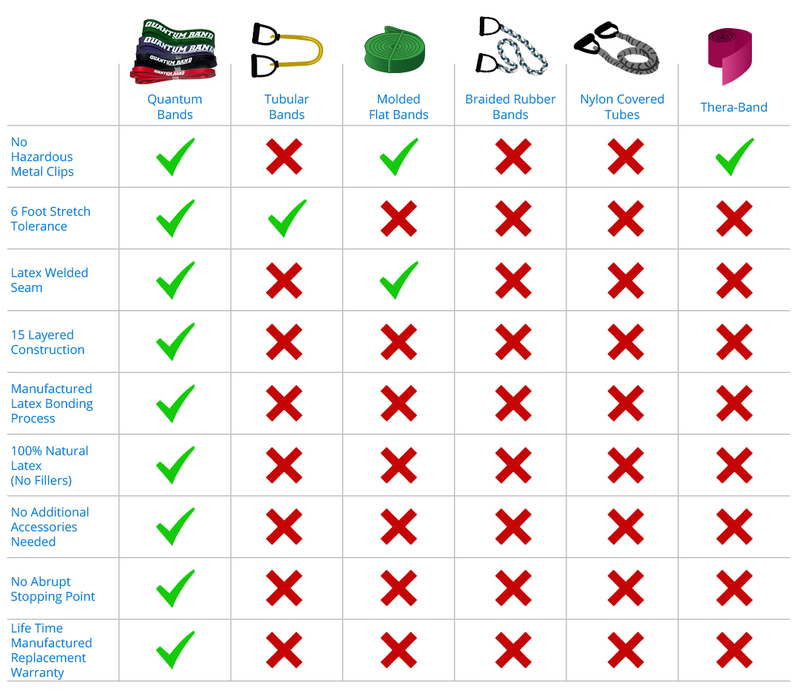 The thing I love most about training with resistance bands and specifically the Quantum Band is the versatility. When life throws you a curveball and you can’t get to the gym, you have to travel for work, or the kids’ activities make it impossible for you to work out at the gym, resistance bands allow you to get in a workout on the go. It takes absolutely no effort to pack resistance bands in your suitcase, throw them in your car, or train with them in the comfort of your living room. That’s something you can’t do with any other piece of workout equipment. Could you imagine lugging a set of dumbbells or kettlebells around with you?! Even with just one Quantum Band, you can challenge yourself regardless of your strength level. Each Quantum Band can produce a range of resistance levels! You can literally adjust the weight (and the difficulty) on the fly without ever switching bands, a virtual impossibility with any traditional piece of workout equipment. This is something you can’t achieve with any of the regular workout equipment. I want to give you an incredible opportunity that is designed for people just like you: the everyday busy guy who wants—no, needs—a workout solution that allows him to train anywhere, anytime, and get results. Most importantly, you need a program that will help you get results without beating you up! Create maximum fat loss in minimal time. Skyrocket your strength gains without making your joints ache and hurt. Deliver insane increases in flexibility and mobility so you’re able to move better and without pain. Walk you through a specific progression of workouts to ensure you avoid plateaus and make constant progress. Bring back your athleticism (it’s still there) and turn back the clock 10+ years so you feel better than ever. This program is designed to maximize your metabolism so you turn into a fat-burning machine while simultaneously helping you regain your true strength—not the kind of strength that’s only good in the gym if you have the perfect setup and all the right equipment. You’re going to rediscover your athletic strength, the kind that lets you play a pick-up game with your kids or buddies without being sore for the next 5 days. It’s strength that you can use in your everyday life and that you need to stay active! Getting older isn’t fun! I know from experience. But following this same program, I’m in the best shape of my life at 52 years old! I hate to tell you, but you’re wrong. You have an athlete hiding inside of you somewhere, and BandSTRONG will bring it out of you. With this progressive system, we’ll start off mastering the basics and gradually progress to more athletic movements so that you gain confidence and get comfortable using the bands. That’s one of the biggest benefits of band training, especially with my Resistance Band Training Systems that are found in BandSTRONG: You can easy adapt the exercises to fit your current fitness level and progress as quickly or slowly as you need. It’s the perfect customizable training tool! BandSTRONG comes with 48 total workouts that you will use over the course of 12 weeks, each workout getting you one step closer to your ultimate goal. This is the same program that I use to train myself and all my clients in my Bands Only Fitness Camp (full of 40+ fitness enthusiasts like you)! Here is all that you’ll get when you pick up this comprehensive training system. 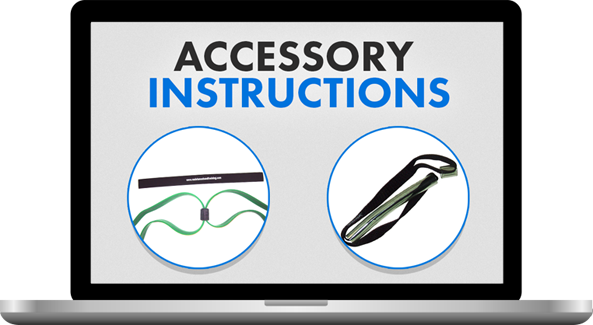 Get the inside scoop on the BandSTRONG system including the theory behind resistance band training and how to choose the right band setup for you. To start, I’ll guide you through 5 of my most effective workout programs that can be used as a template throughout this program (and well after) to design great workouts. I’ll also be showing you how to adjust the intensity of each workout so that you can get started no matter your fitness level or challenge yourself to the max once you’re already fit. If you plan on training hard, you need to prepare your body the right way! This quick and simple 8-10-minute warmup will help you regain some flexibility, improve your mobility, and get you physically prepared to complete your workout for that day. No more boring treadmill warmups! This warmup is specifically designed to prepare your body to do some serious work and make the most of your time. Don’t confuse “Base Training” with easy training! At the start of any new fitness program, you need to establish a solid foundation. Just like when building a house, the stronger and bigger your foundation, the sturdier your house will be! During these 3 weeks, we will get you accustomed to training with the bands and gradually ramp up the intensity of the workouts. However, you don’t have to start at the easiest level. With Resistance Band Training, you are able to quickly and easily adjust the resistance you are using by increasing the tension on the band, adjusting your position a little, or moving up to the next band level. The key here is making progress each day to get a little stronger, become a little fitter, and move a little better. You’ll be feeling like a million bucks in no time! After you’ve build a solid base, it’s time to really crank it up. This is where you will get the biggest improvements in your strength and fat loss. The workouts will move at a faster pace, and you can really start challenging yourself each day to get stronger. This is where you build the real-world strength we talked about earlier. You’ve done all the work; now it’s time to rediscover your inner athlete! During this phase of training, we will incorporate more athletic movements to train your body to act and react like an athlete. The best part? When you move like an athlete, you look like an athlete! Along will these 3 very specifically designed phases of the program, you’re going to get 50+ band-specific exercises and 5 completely different interval workouts to use during your training. This variety ensures you never get bored and you never hit the dreaded plateau in your training. Never worry about forgetting how to do an exercise or wondering if you’re doing it correctly in this program! We’ve got a complete list of “Learn By Doing” videos where I personally demonstrate the proper technique so that you know exactly how to use the bands safely and for optimal results. I’ll also demonstrate how to make each exercise harder so that you can continue to challenge yourself as you gain strength and rediscover your athletic ability. 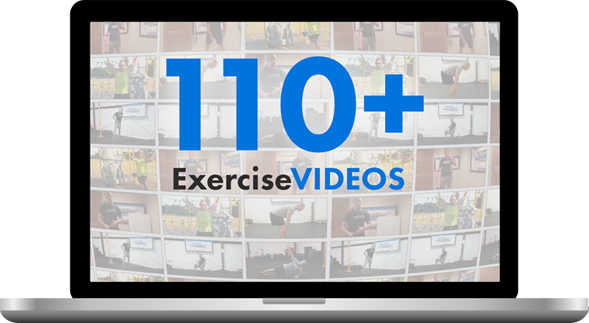 You’ll never get bored with your workout program again! to accelerate your progress… FREE! I get it, I get it—sometimes you just want to jump right in and get started! That’s why I’ve created this Quick Start Training Guide and 3 Quick Start videos for you to use so you can get started the day your bands arrive at your doorstep. In this comprehensive manual, you can get up to speed on band training technique and theory to make the most of your BandSTRONG program. That way, when all your friends ask about your secret to success, you can wow them with some knowledge! I left no stone unturned when creating this resource to ensure you make the transition from regular weight training to training with resistance bands! 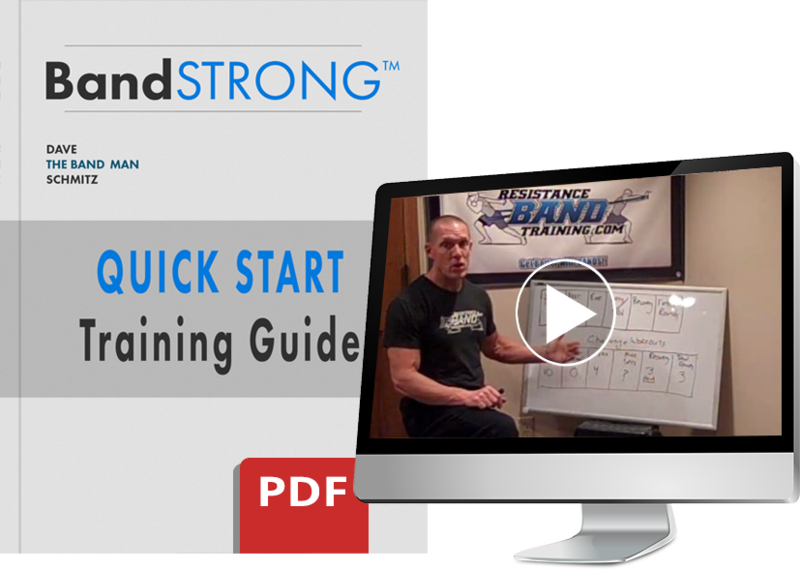 If the manual wasn’t enough, I’ve included 4 quick videos that take you through best setups so that you know exactly how to optimize your BandSTRONG workouts. These tips have come from my years of experience training with bands and working with thousands of clients using bands as my only training tool. You can’t rediscover your inner athlete or turn back the clock if you don’t prepare for your workouts correctly, take care of your muscles, and do the required flexibility and mobility work. So I made it easy and created 3 quick videos to show you exactly what to do in 10 minutes or less! After a few days of following these foam rolling, activation, and stretching videos, you’ll feel better than ever and be ready to train harder than ever. Along with your band package, you're going to be getting a few of my favorite accessories to ensure your Quantum bands last for years to come and to help you maximize your workouts. Learn exactly how I recommend you use the Band Utility Strap and Link Strap to take your training to the next level and protect your bands from unnecessary stress that can lead to excess damage. My Quantum Bands are resilient and handle all the tough workouts that you can throw at them if you treat them right. You can’t get an athletic physique without proper nutrition! So I asked my good friend and transformation expert Ryan Ketchum to create a manual for you to use in the BandSTRONG program. This is the same plan that thousands of his personal clients have used to get incredible results and that is used in some of the best transformation personal training gyms in the country. You get it as my gift to you! Not only will this nutrition plan help you get the body you want, but it will also ensure that you are fueling yourself to perform at the highest level and creating a sustainable nutrition program for yourself. 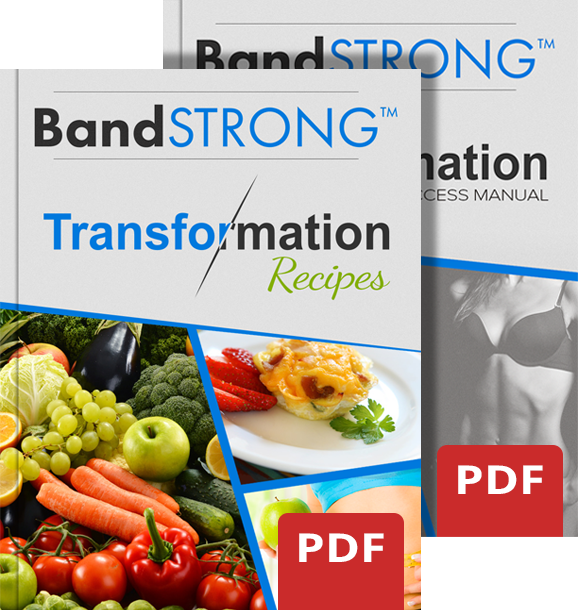 Just like with BandSTRONG, your results with this nutrition program will last long after you have finished the 12-week program. 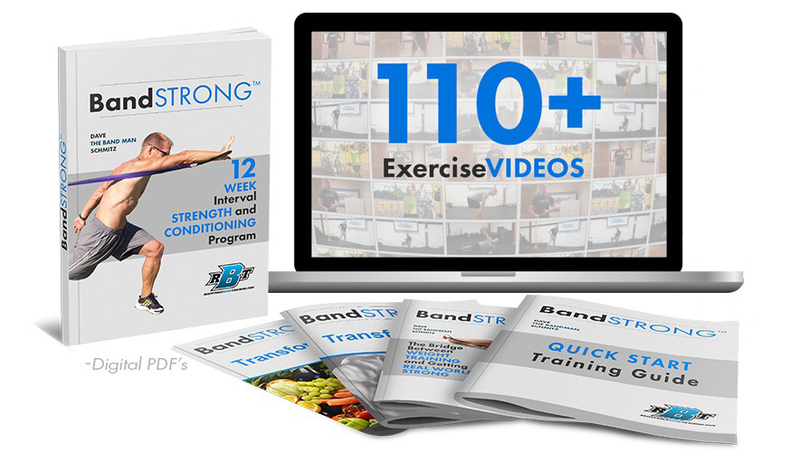 Get My Complete BandSTRONG Training System and All the Bonuses for Just $49—But Only If You Act Right Now! I have no doubt that you see the value in everything you get with the BandSTRONG training program. If you bought all the components of this program alone it would cost you over $79.92 and that doesn’t include shipping! A 3-month membership at most gyms (the good ones) cost more than $100. Not to mention all the frustration you’ll experience having to fight the crowds at popular times, trying to figure out how to use the equipment, time wasted traveling back and forth, and missed workouts due to your crazy schedule. For less than a family meal at a fast food restaurant you can have a 12-week workout program that I’m guaranteeing will get you the results you want without all the frustration of having to go to a gym even if you’re extremely limited on time. I’ve personally tested these workouts on myself and all my clients to ensure that they work! I’m so confident that they will work for you that I’m offering up a 100% money back guarantee. If for any reason you are not completely satisfied with your results or anything about this program, simply let me know and I’ll refund your entire investment. Try the program for 90 full days, and if you don’t love it and the results you’re getting from it, let me know and we’ll give you ALL your money back! Lots of programs work, but THIS ONE is different! So why is this one different? Well, first of all you don’t need a gym or any fancy equipment to make it work for you! You can complete the BandSTRONG program right in your own home. This is the only workout program designed specifically for you to rediscover your inner athlete without beating up your joints. Have you ever tried one of those plyometric-loaded, heavy-lifting workouts you find online? I sure have, and they leave you achy and beat up after just a few days. Each day you complete the BandSTRONG workout, you’ll feel stronger and more alive than ever! 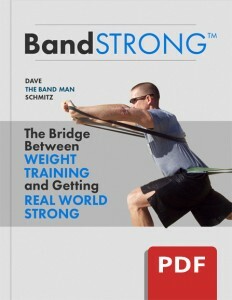 BandSTRONG also isn’t a mix tape collection of workouts presented to you in a DVD format. Most DVD home workout programs are simply a video of what you would expect to see in your local YMCA or fitness center on the group exercise schedule. In BandSTRONG, you’ll get a progressive training system that looks a lot like the ones the pro athletes I’ve helped train would use. The only difference is that I’ve created this one specifically for people like you who need to rediscover their athleticism. This isn’t just about getting strong, losing fat, or improving your fitness; you’ll do all those things in BandSTRONG, but the most important thing you’ll do is to turn back the clock 10+ years and rediscover your athleticism at the same time. The ability to train anywhere, anytime. Improved strength, flexibility, and athleticism. It’s simple: You’re going to look, feel, and move better than you have in years! 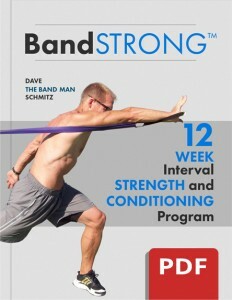 The BandSTRONG system will work for you if you are willing to commit to as little as 90 minutes of workouts per week. These specifically designed interval training workouts will maximize your time and results. Pair that with the ability to train anywhere you go, and you have a winning workout program. P.S. It’s time you took back the control of your fitness! Getting older doesn't have to mean feeling bad and looking even worse. For a limited time, you can get this complete system, worth $581.90, for just $49, and at the end of 12 weeks, you’ll feel 10 years younger. You can keep doing what you are doing now and pretend that it’s going to get you a different result, or you can try BandSTRONG and rediscover your athleticism. P.P.S. Remember, you’ve got a full 90 days risk free to try out the program. I know you're going to love it (and the results you get from it), but if for whatever reason you decide it’s not for you, just let us know and I’ll give you your money back.